Black excellence was in full display on yesterday’s episode of FOX’s underrated sports talk show “UNDISPUTED”. If you have not heard of or seen the show before, it’s exactly what “First Take” is for ESPN. If you have not seen or heard of “First Take”, then do some research! Countless memes and amazing video clips (both funny and serious) have been created on First Take and now UNDISPUTED is stepping into the lime light. UNDISPUTED features a woman moderator named Joy Taylor and two anchors; the LeBron hater Skip Bayless and the black history making, durag wearing, black & mild smoking, YAK drinking *Insert a “WOOOOO” in my best Ric Flair impression* Shannon Sharp. These two men battle each other every morning with their words and opinions on all things sports. Issa sports talk show! Lately, the show has gained a lot of attention due to the Colin Kaepernick situation, The Commander in BUM (as LeBron would say) throwing tweets at the NFL, and the kneeling of most teams during or before the national anthem. The mixing of politics and sports gave the show a chance to broaden its scopes and tackle bigger issues that are affecting the sports realm. 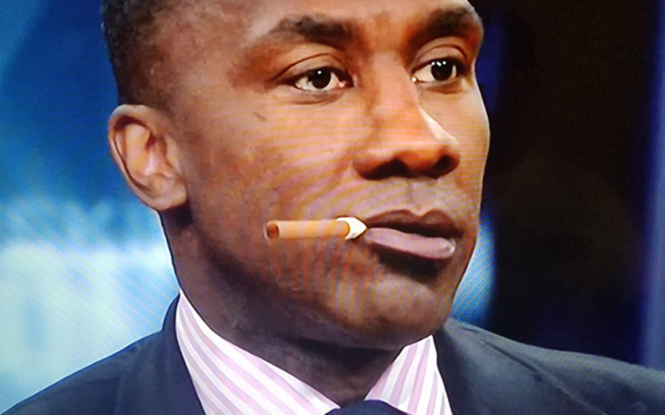 Police brutality, slavery, racism, white privilege, and more have all been talked about on the show thanks to the courage of Shannon Sharpe! Shannon is not scared about what his white co-star will think. He also doesn’t care about how he may make his white co-star, the white viewers, or the whole station uncomfortable. He tells it like it is with dignity and respect. We need more people like this in TV. Not only is he being a role model to many African Americans young and old, he is also setting a lot of people straight on what's been going on the last few years in this country from a black man’s point of view. It’s phenomenal! That is not why we are here! This aired on FOX by the way! Black twitter went crazy with memes yesterday and rightfully so. The reason this post was needed was not because I smoke $0.99 Black & Mild’s or drink YAK (on occasion I do enjoy a nice cigar and a fine cognac to go with it) but because even a man of Shannon’s stature can go on very conservative, white network where he talks sports in the morning with a Black & Mild and yell YAK to his white co-star. He’s himself, and doesn’t lose that when he goes to work, when he is around people who may not understand or agree with him, or in his stardom as a TV talk show star. Shannon is a proud, woke black man who continues to showcase that every day! Shannon is what we call, “a real N**ga” not in a disrespectful way, or in terms of the streets, but he is a black man that is real to the core. He doesn’t alter his views on America and her problems just because he gets a six or seven figure salary from a predominantly white network. Learn from Shannon! Be yourself, be unapologetically you! Be respectfully outspoken on issues you disagree with. Don’t alter your views on what the majority thinks. Be ready to defend what you believe even if it means you have to call out the people you love. (Ray Lewis vs. Shannon Sharp) and most importantly, push the culture forward at all cost. So if that means yelling, “I WAS OFF THAT YACK HARD YESTERDAY” while you have a black & mild in your mouth on live TV, and then beautifully articulate the reason why black Americans protest the national anthem; then do ya thing big fella! Be unapologetically YOU!